Tomorrow, it has been stated that it will feel like 102! 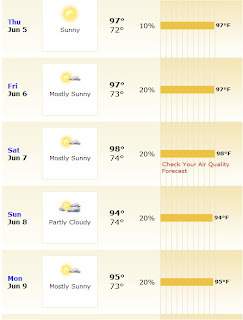 Now, I like warm weather and try not to complain too much but holy cow, this is a wee bit too hot. Our weather is not like this until late summer, looks like this summer could really be a long hot one. If you notice that there is not a drop of rain predicted nor is there a chance of a stray storm. Alrighty, I am off to cool off and relax a bit at the pool.